Parties are more fun if you get a printed invitation card asking you to be one of the guests. Not only does the invitation speak about the host’s party preparation skills, it also means that you were one of the limited people whom the host has thought of would be a good addition to his/her celebration. You may also see invitation designs. However, thinking of a good birthday party theme and all the hullabaloo associated with party planning can sure stress anyone out. That is why we endeavor to help you out (just a little bit) on the invitation card design front. In this article, we provide twenty (that’s right!) 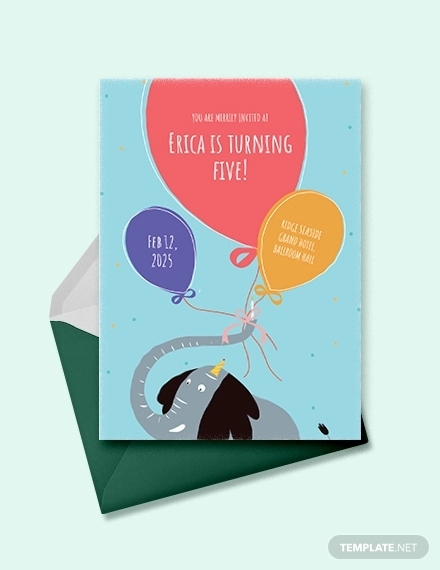 birthday card invitation designs that you can use for any birthday bash that you may be planning for other people or for yourself. 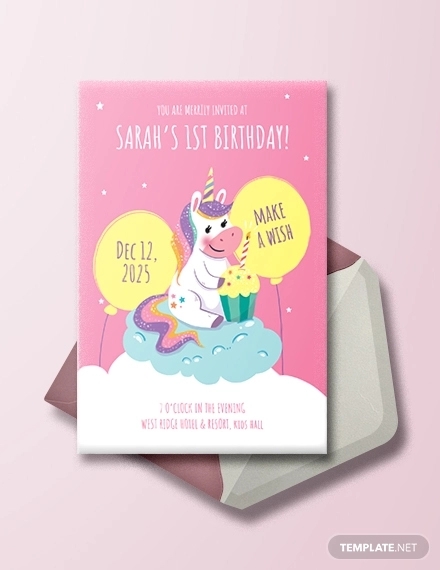 Look into these card designs carefully and choose one that will best match the greatest birthday bash that you could think of. 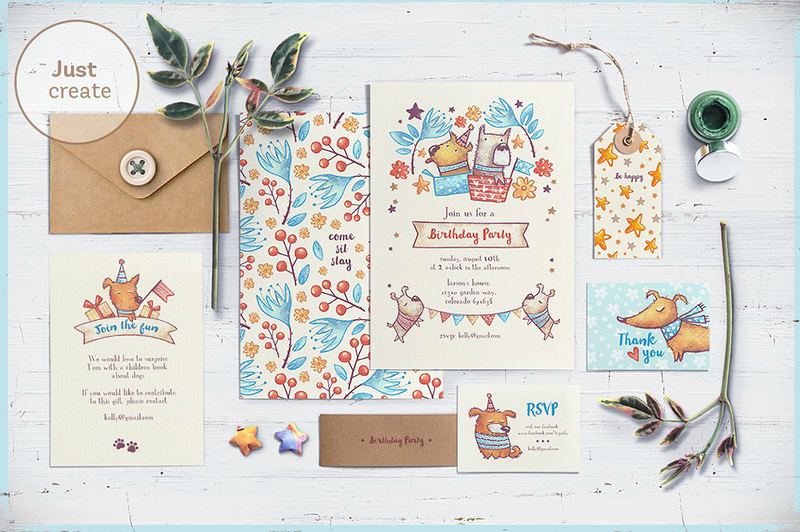 Selecting an invitation card design would mostly depend on a party’s theme. Ask yourself these four questions we have listed below so that you can best judge your own abilities and resources. When you answer truthfully, you will have an easier time organizing your party and also potentially have loads of fun creating your invitation cards. What do you or the birthday girl/boy like? Most of the time, a party’s theme is decided by the person who is celebrating the birthday (though surprise birthday parties are an exception). Either way, a party’s theme should be based on the person’s likes and preferences. For little kids who loved the Disney movie Frozen, parents may decide on a Frozen-themed kiddie party and send out invitation cards with Frozen character cards. The same thing applies to adults who are throwing birthday parties albeit they prefer more age-appropriate themes. It’s your party after all, so you should only do things that you love. How much is your budget? Creating birthday invitation cards can be costly. If you have no graphic design skills, you may have to purchase designs from graphic designers and then fork out more money for printing out the cards. If your budget is limited, you may look into making handmade invitation cards instead. How much time do you have? Party planning and, most especially, invitation card making can take up a lot of your free time. If you decide to still go through this path, you can create your invitation cards at least 1 to 2 months before the celebration date. Your theme and subsequent invitation card designs should depend on the time that you can prepare. To illustrate, you cannot successfully plan, design, and execute a twenties-style party in less than two weeks of preparation. Unless you already have all the resources like costumes, venue, crafting tools, and other people who will do all these tasks for you, you will be in a bind. If you want an artsy birthday party theme, you should just give yourself ample of time to plan out the party and also to design those artistic birthday greeting cards. What are your design or crafting skills? If you have already decided on the theme of your party, you should next assess your personal design and crafting skills. 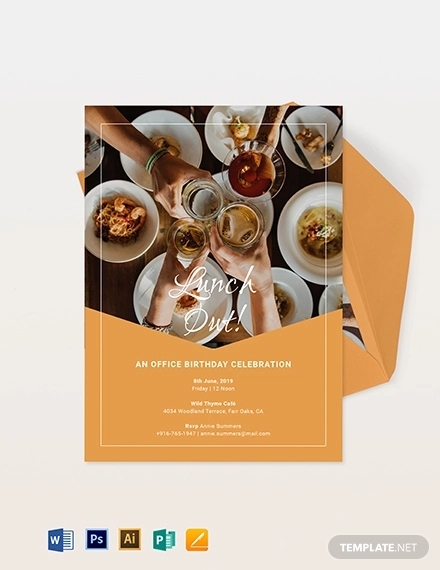 If you know how to use Adobe Photoshop or Illustrator, you may not have a hard time in customizing invitation card design templates. And if scrap-booking is your hobby, you may not have an issue with creating dozens of invites following a pop-up card design. How committed are you in making this project a success? It all boils down to how much you want this event or celebration to succeed. It is a party for yourself and you should be the first person in the world to want it. Themed birthday parties do not have to be those formal sit-down dinner types. You can plan a staycation, spa party, or pool party with friends and use matching pool party invites. You get to decide what type of party you want, who to celebrate with, and what type of RSVP card to use. After thinking hard (hopefully) of your answers to these guide questions, it is time to get the ball rolling and start the party planning process. First up, the birthday invitation card design! Scroll down to view a list of impressive invitation card designs. As its name suggests, this birthday invitation card design prominently features a metallic gold gift wrapping ribbon on the card’s face. All information regarding the party is concisely written on a dark gray background within the page. Just like other birthday card designs in PSD, the Ribbon Birthday Invitation Card design is available in PSD format. 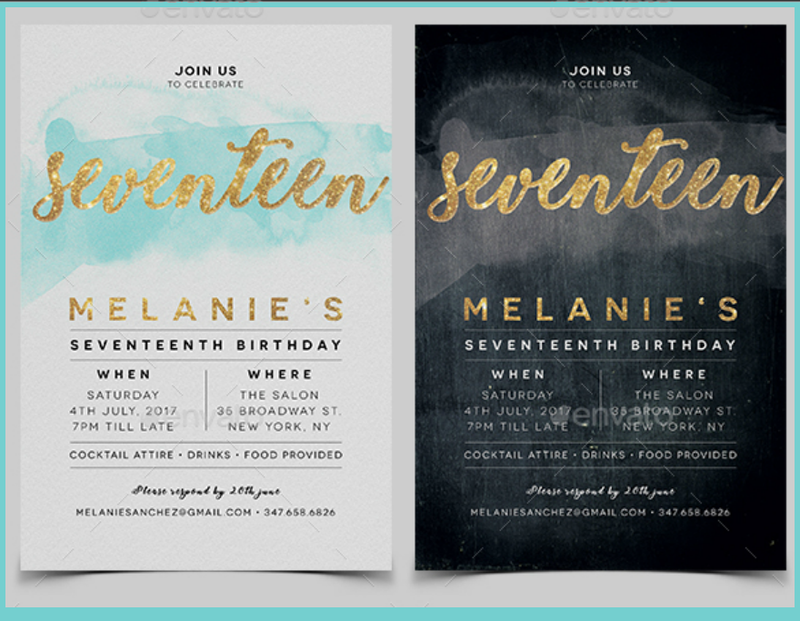 Upon purchasing the card, you are able to edit the invitation’s text color schemes. This invitation card design may suit those who do not want elaborate invitation card designs but still want to conform to traditional pre-party invitation-giving rituals practiced by some people today. With this card design, you will be able to easily edit the party details on the file, print them out, and send them to prospective guests. 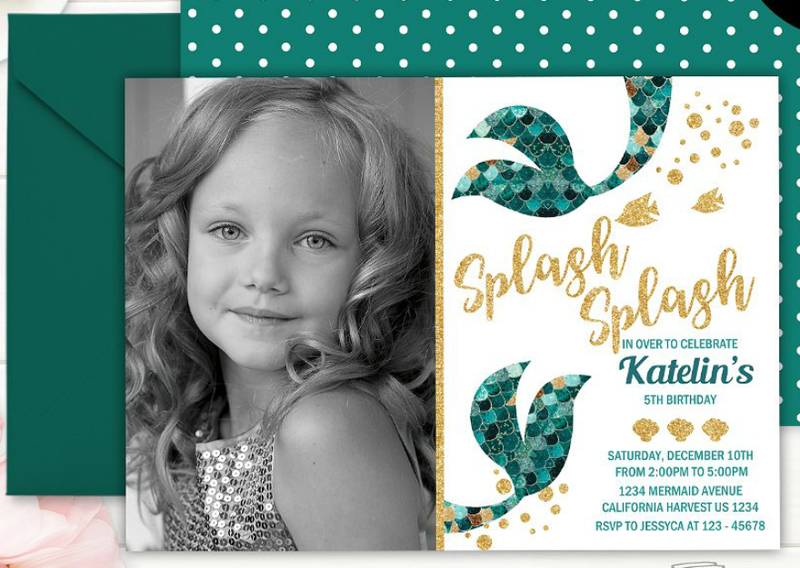 The Mermaid Girl Birthday Invitation card design will suit most young girls and tweens who wish to enjoy a sea-themed birthday party. In order to achieve the same effects as shown on the mock-up image above, it is best to also include a photo of the birthday girl. To match the card’s sea green, blue, and glittery gold, you may apply a gray-toned filter to the photo when editing it. The seller of the card design also offers free text customization in the event that you are unable to make the edits yourself. You may also order finished copies of the invitation card and the graphic designer will print and mail the cards to your address. 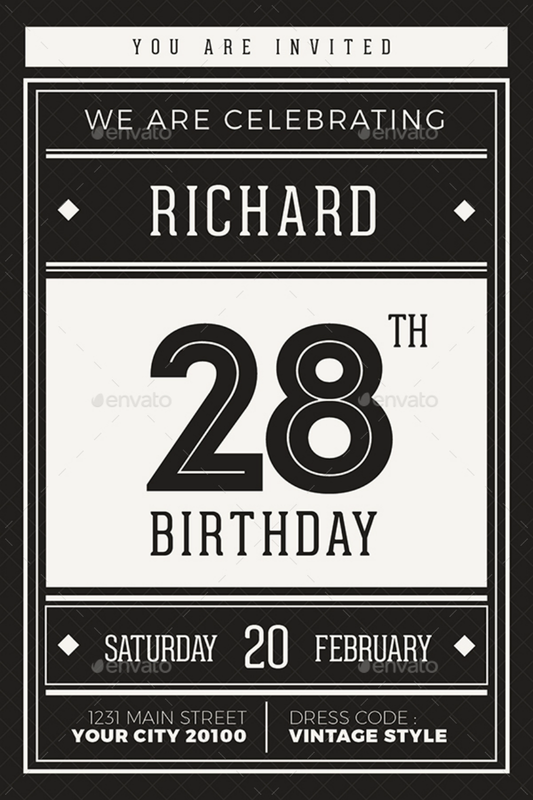 This Retro Birthday Invitation Card design that you can find on Creative Market is one that showcases a minimalist design due to its black, gray, and white color scheme. It also helps that the other design elements used in the card were not flamboyant. 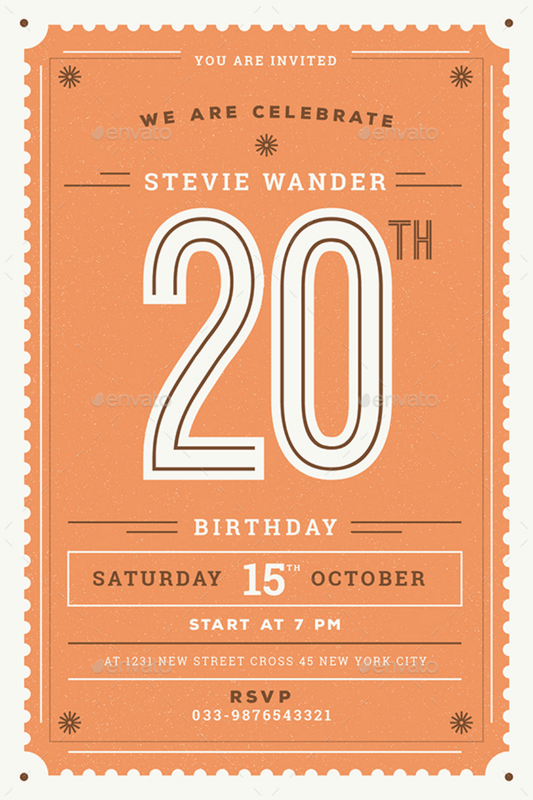 Using retro styles for a birthday invitation card goes well with parties that are exactly following a retro theme. The invitation card mock-up design embedded above states that the card is for an 18th birthday party celebration but it can be edited to correctly show your birth year. The card may also work for both males and females since the retro theme can be applied to both genders. 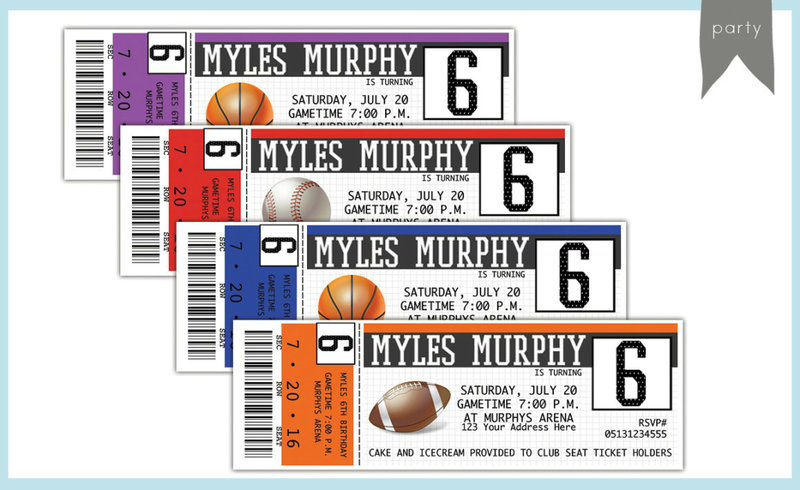 Sports-loving individuals will love this invitation card design since it creatively combines the concepts of a game ticket and a birthday celebration. 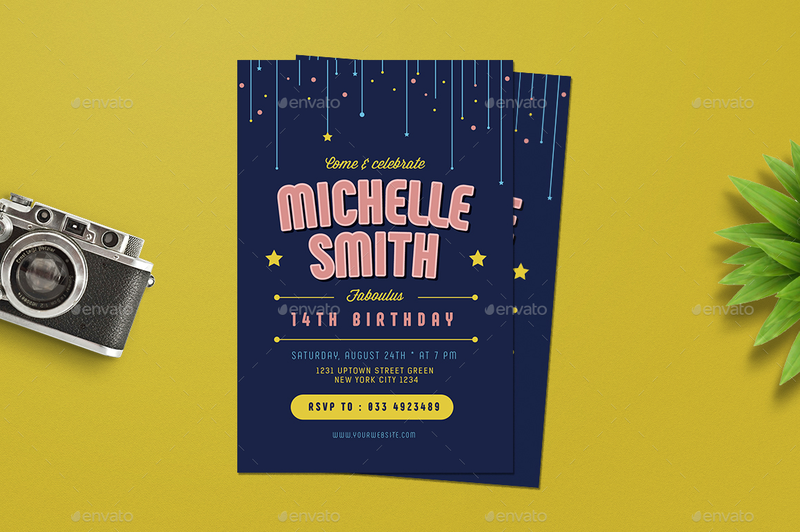 This card design is in PSD format that will allow you to edit any information on the invite. The sports logo on the ticket may also changed depending on the type of sport that the birthday host likes. The creator of this invitation card design also has an Etsy store where you can order printed out cards. Another advantage of using this invitation design is that the card may be used by anyone from different age groups since it covers a topic that interests a lot of people. This card template is printed on a 4 × 6 inches paper or card stock, so make sure you have these materials ready before printing these cards. 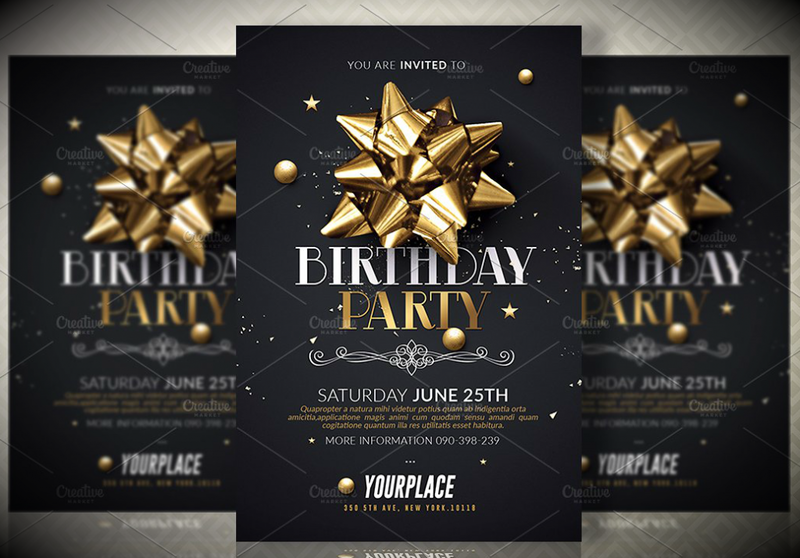 The Great Invitation Card Design is another birthday card design available in PSD format that you can purchase and then customize on your own. If you want to achieve the same effects on the mock-up above, the card is best printed on a blue card stock. Or you may opt to use a plain white premium quality paper and let your printer do all the color printing job. The card’s graphic artist states that this particular card design is photo-realistic—which means that what you see on the picture will be just like (or close to) what you will get when the card is printed out. But note that you still need to combine and layout all the design elements to create the invitation card before you can print it out. All design elements shown in the mock-up card above are included in the PSD file. Art Deco was a common theme in the art scene during the 1920s, but its applications can still be seen in various industries today like architecture and interior design. This Art Deco Birthday Invitation Card design is reminiscent of that era with its bold, clean lines and geometrically-symmetrical design elements. If you want an artistic card design, this card may match your tastes. The art deco invitation card also works well with formal birthday parties and other formal events where guests have to dress up in gowns and suits. This card is available in two color schemes: silver and gold. 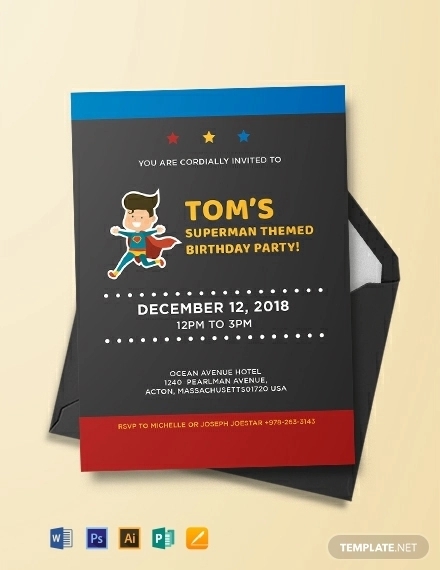 If you want to do away with superhero themes for your child’s birthday party, you may opt for a simple summer day theme just like the invitation card design embedded above. This kids birthday invitation card design in PSD features pastel illustrations of birds, birthday banners, and an arcade ticket overlay. This type of invitation card will suit very young kids who cannot yet distinguish between different toy products and themes. But despite its simple design, this invitation card mock-up is a complete package for any parent who wants seamless party preparations. This design kit will already include a 5 × 7 inch invitation template, a thank-you card template, a place card template, and party label templates. This card is also available in three color variations: green, blue, and yellow. You can find other minimalist designs here. 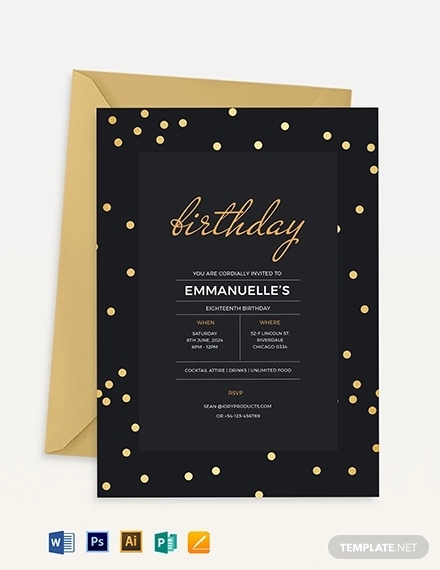 As one page invitation card, you will be able to save up on any printing costs that you may accrue when you use the Elegant Birthday Invitation Card. Purchasing this card design on Graphic River will give you access to editable Photoshop files of these card templates. You may also choose between two design variations: chalkboard black and watercolor sky blue. The fonts used for this card design exudes class and sophistication. 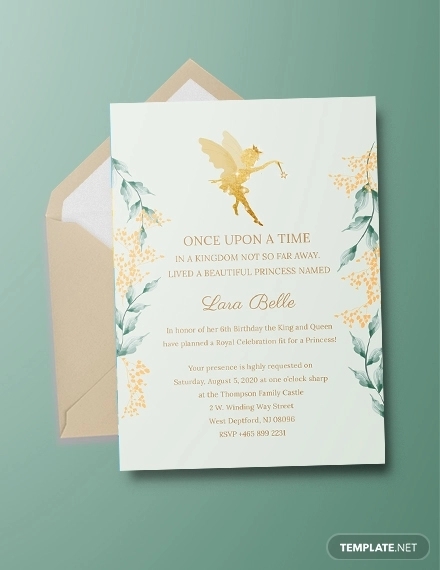 And when these font elements are combined with the card’s background, you will get an elegant-looking invitation card that can both be used by males or females. But if you prefer to further change up the color schemes, you may do so since the file is fully customizable. This card design may remind you of those old color cartoon shows and newspaper ads. In this vintage birthday invitation card, an image of a little boy or girl blowing the candles on a cake is the focal point of the card face. The typography used with the photo is also consistent with the vintage theme. This card will suit most kids and, perhaps, also adults who want to reminisce the old times during their birthday celebrations. 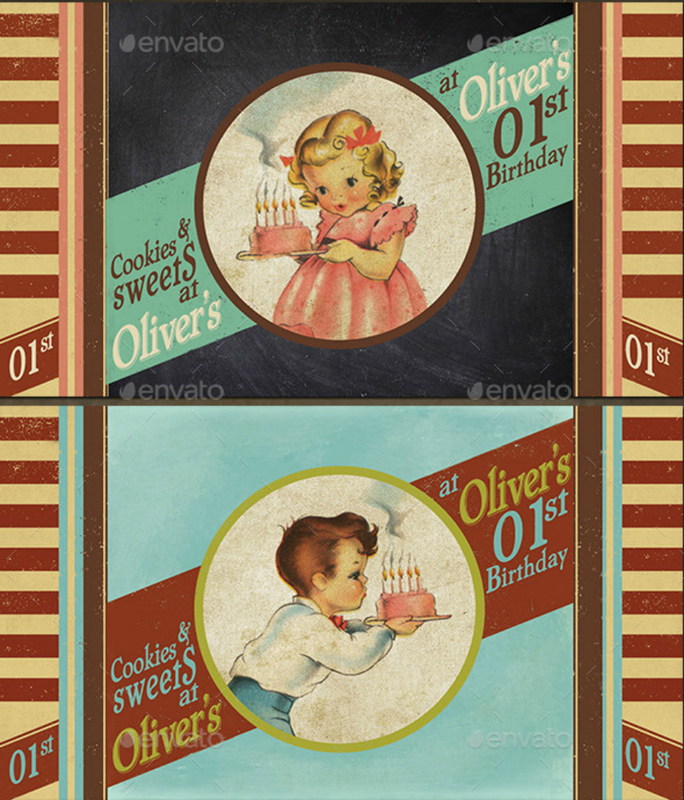 The Vintage Kids Birthday Invitation Card is available in two variations: one for boys and another for girls. All images included in this PSD file are high resolution images and are fully editable on Photoshop. On top of that, a coupon card is included in the invitation as a form of souvenir for the party attendees. Also note that you will need to separately download the fonts used in this design before you can edit them correctly in Photoshop. Looking for other vintage design inspirations? Check out these vintage invitation card designs. 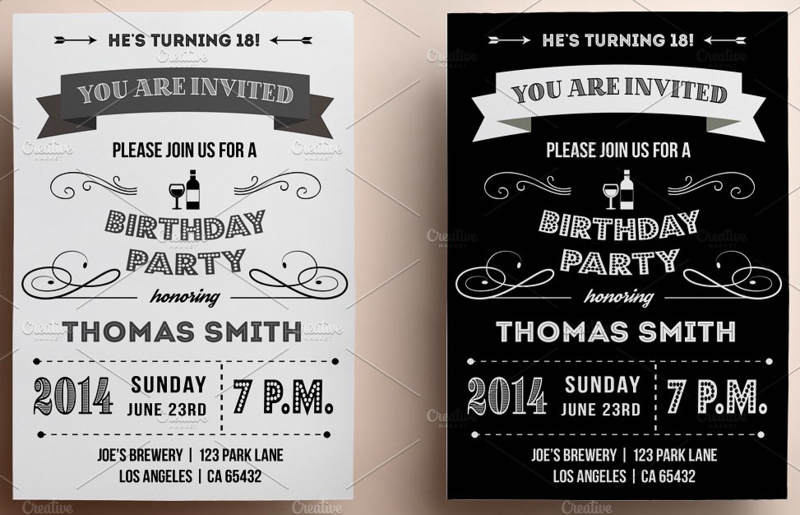 The Birthday Party Collection is a set of nine pre-made birthday invitation templates in PSD format. When you download it, you can edit the text on the invitation templates and on any of the other card templates included. The Birthday Party Collection’s invitation card design features small dogs specially-illustrated to showcase their distinct animal personalities. This card design is perfect for those who wish to have pet-themed birthday party or just about any kind of party since the card has a universal appeal. This design set also includes templates for creating RSVP cards, gift tags, info cards, thank-you cards, and a round button design featuring those cute dogs. 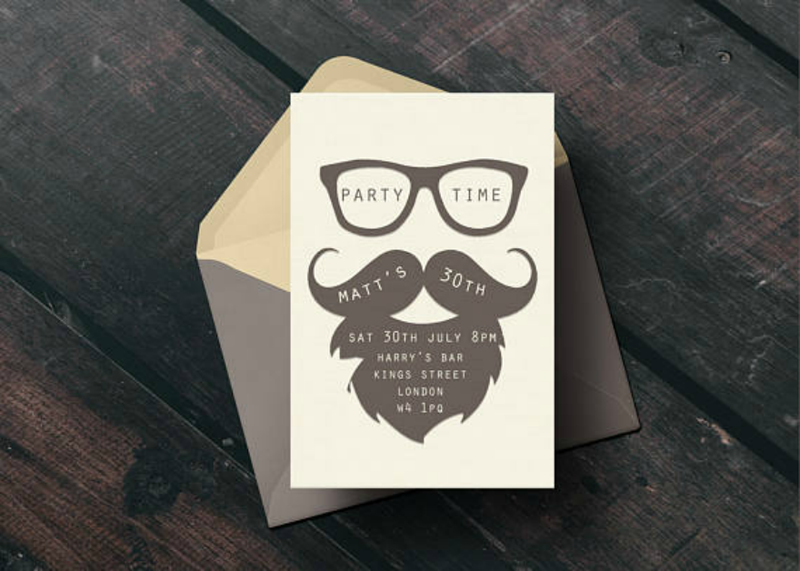 The mustache birthday party invitation card design is perfect for adult males who want a witty birthday invite to give out to friends and colleagues. It is also reminiscent of Father’s Day greeting cards. The card design typically appeals to those in the late young adult group since it makes the aspect of growing old. The card is available as a digital download and you may print it out from the convenience of your homes. Its designer is also able to make the necessary changes regarding the party details as part of the purchase price. Note that the envelope is not included in the order. Kids love themed birthday parties and those sporty ones tend to gravitate around party themes that allow them to play and eat at the same time. 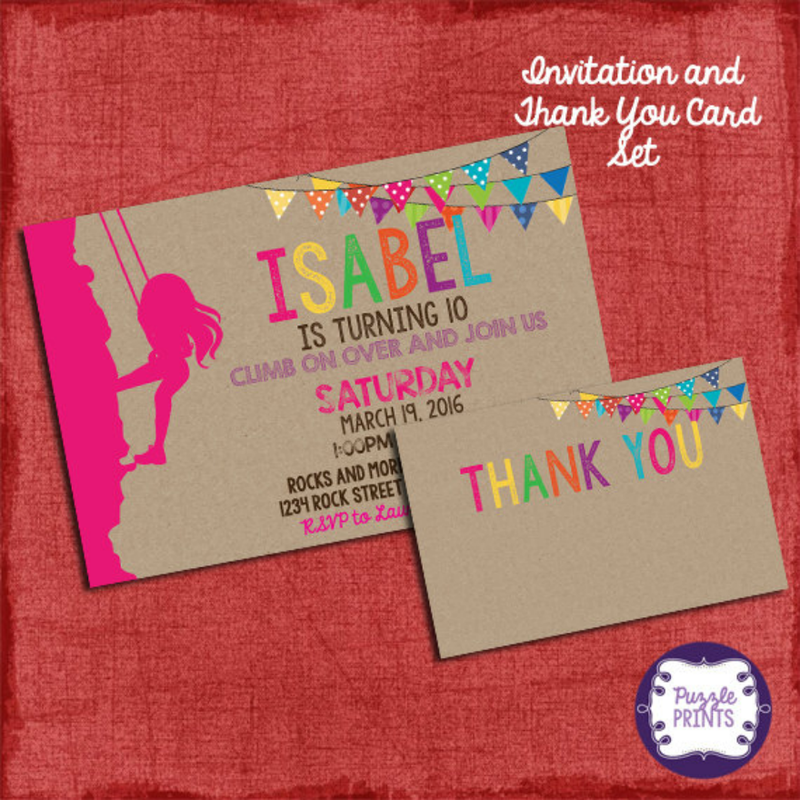 This rock climbing birthday party invitation card design is perfect if your young one loves to try out rock climbing together with his or her friends. 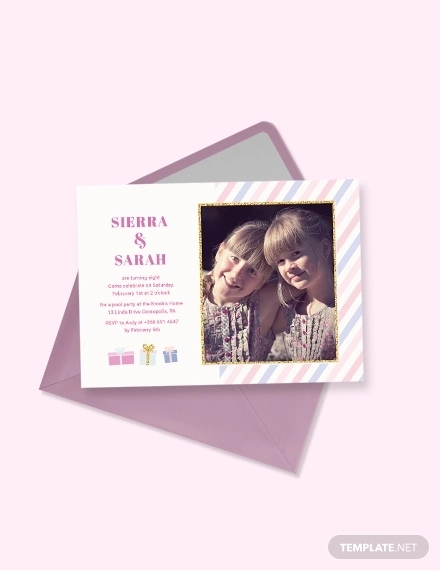 The mock-up version of this card (shown above) is specifically designed for females with its pink and pastel banners and fonts colors. But not let this deter you since the card can be customized if you are going to use it for your son. Another plus side for using this card is that it can be used by adults who want a rock climbing themed party. 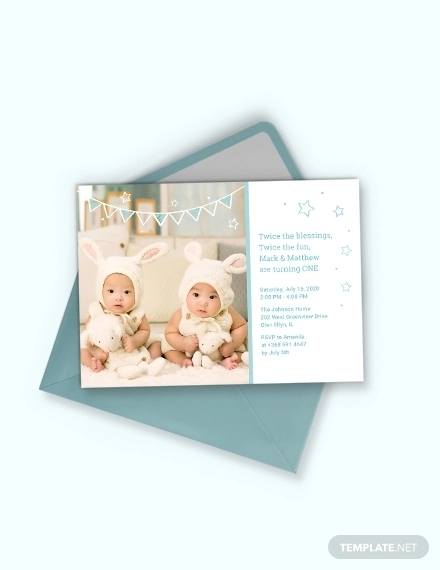 Upon ordering, you will be asked to write the party details so that the seller can customize the card for you. You also have the option to use your own image editing software (if you own one) and make the edits yourself. Bowling is another sport that some people love doing as part of their pastime activities. 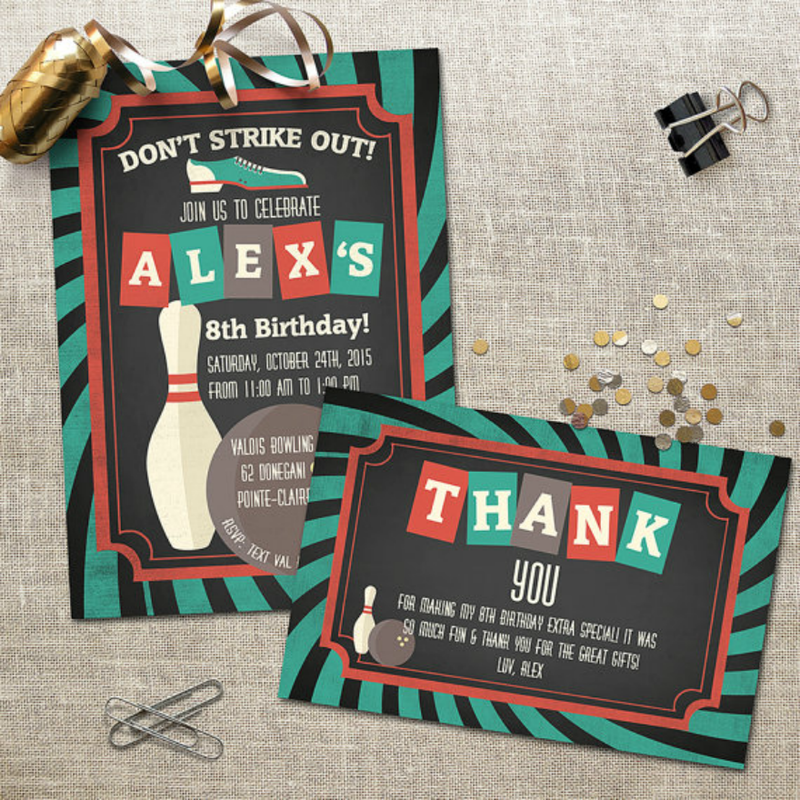 If you decide on spending your next birthday at a bowling alley with friends, you may consider using this bowling-inspired birthday invitation card design. The card features a single bowling ball and pin, bowling shoes, and the necessary party information in a blue-green, red, and gray color scheme. The card design may work excellently if you are planning a birthday bash for your son, husband, or any male friend. Purchasing this file as a digital download also gets you a free thank-you card template. For other party inspirations, you may try these bowling party flyer designs. 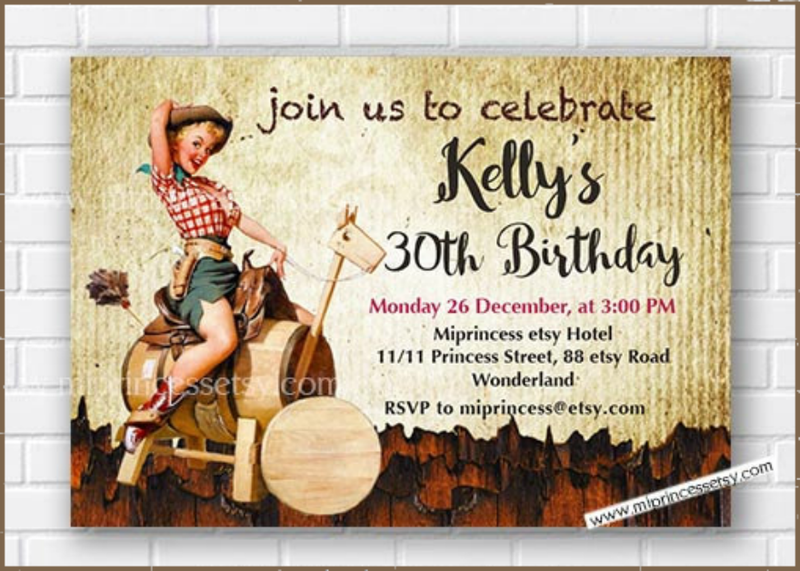 Another quirky birthday invitation card design is this cowgirl-themed invite. The card shows a blond cowgirl riding a barrel fashioned like a bull. This card design is obviously for mature recipients and would work well for adult birthday celebrations. 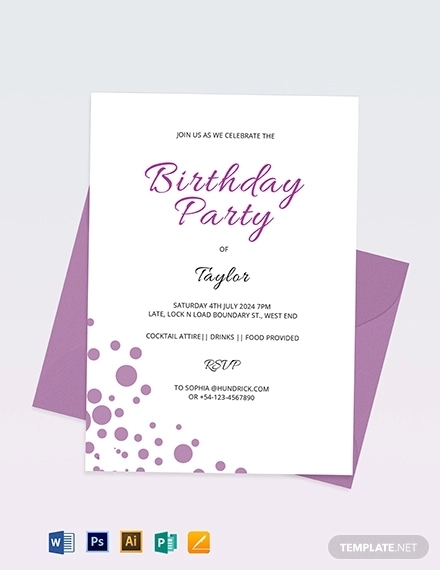 All your party information will be edited unto the card before the seller provides you a copy of the printable invite. 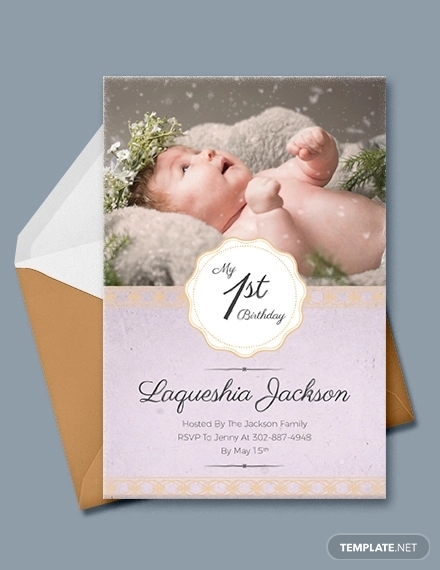 The cost of the card will also depend on the size of the invitation card that you will choose. 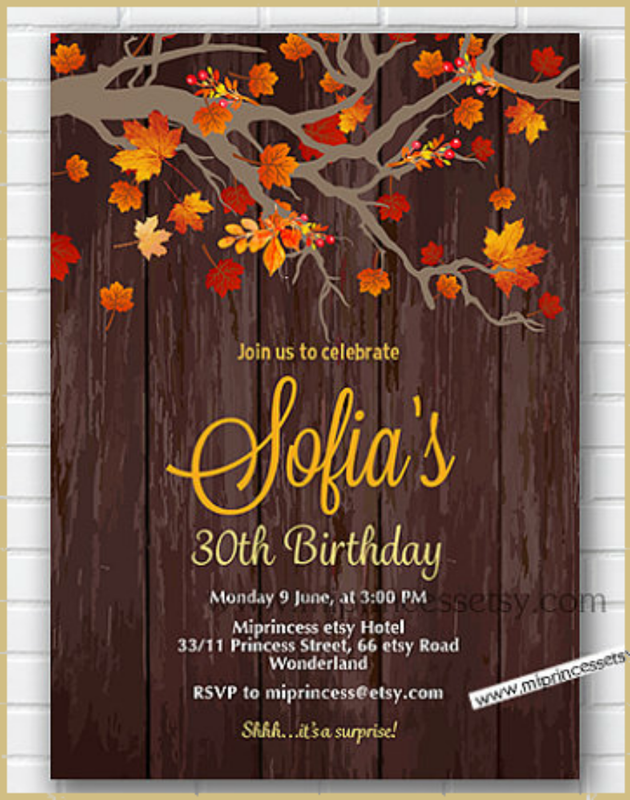 The Rustic Fall Birthday Invitation will suit those who want their invitation cards to match the season when the party is going to be held. This card works well with birthdays that occur during the fall season. 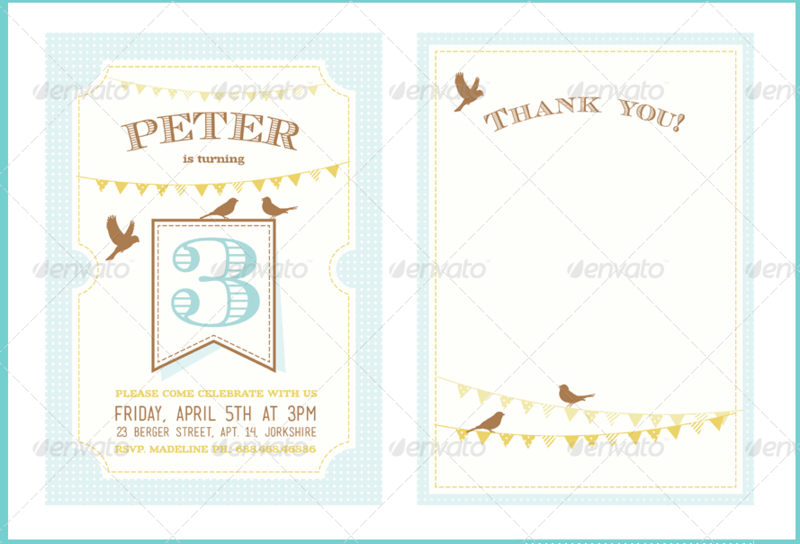 It will also work well for formal parties and will work as a substitute for the more formal invitation card designs. The card can also be used by both the males and females. The Bunny Race Invitation Card design best suits kids less than five years old. Parents will also like the wholesome and cute illustrations on this card. It features a young rabbit riding a top-down race car. 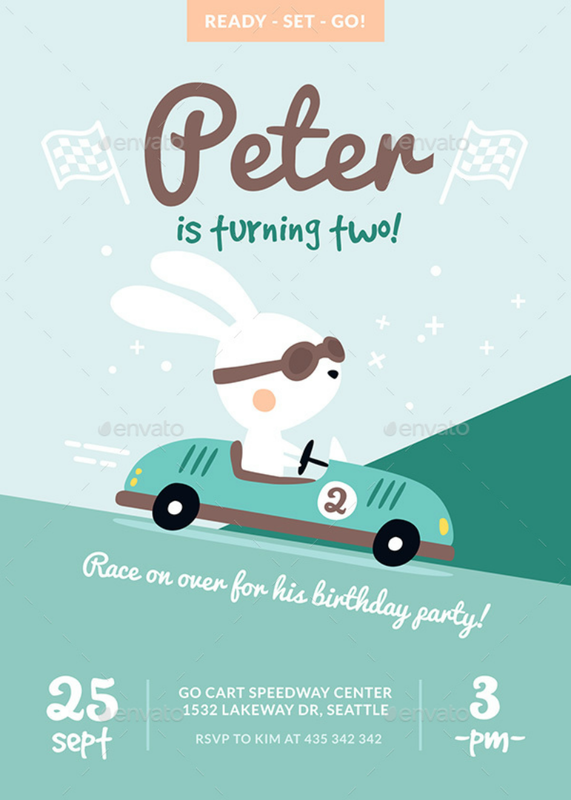 This card design will match those parents who plan to create a car-themed birthday party for their toddlers. Downloading this invitation card will allow you to choose between four rabbit characters and three different PSD file formats for each card side. Fonts used in crafting the card are also included in this digital download. This is another vintage themed birthday party invitation card design. The typography used are also reminiscent of begone years. A vintage birthday invitation card will work well with the older generation since they are able to relate to older themes. However, some of the younger generation are also able to appreciate this theme. This card design is available in different color schemes: blue, orange, and mint green. This card design exudes cheerfulness with its bright colors. The font styles used also make the card seem to move and pop out. Despite all these, the card still manages to maintain a simplicity that can be used by both males and females for their respective celebrations. Upon purchase, this invitation template allows you to edit its text content, colors, and image elements. 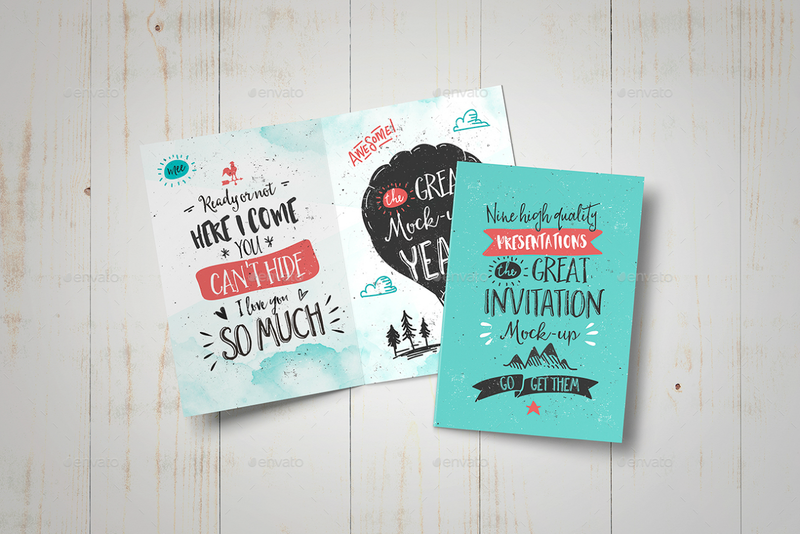 The invitation card design embedded above is an example of a hipster-themed card. It features hard lines, squares, and a monochromatic color scheme. This kind of invitation card may complement those who are planning formal dinner parties hosted. 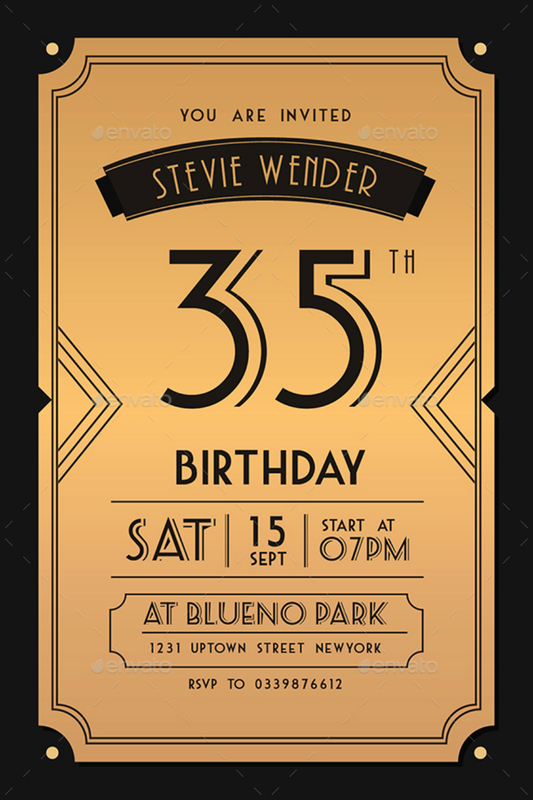 The Hipster Birthday Invitation Card Design is available in brown, navy blue, and gray color variations. You may use these cards with other hipster pattern designs. 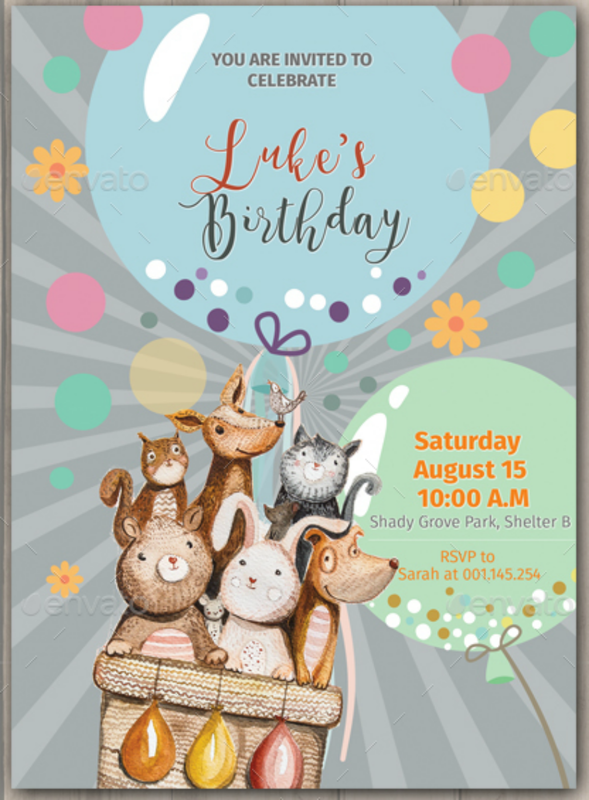 Kids will adore this Animals Birthday Party Invitation Card Design. The animals and hot air balloon elements on the card were illustrated with a slant toward the younger audience as evidenced with the pets’ smiling faces and general cuteness. It was first made in watercolor before it was scanned and transformed digitally. If you are a parent looking for design inspirations for your kid’s birthday party, make sure to bookmark this card and show it to your kid. 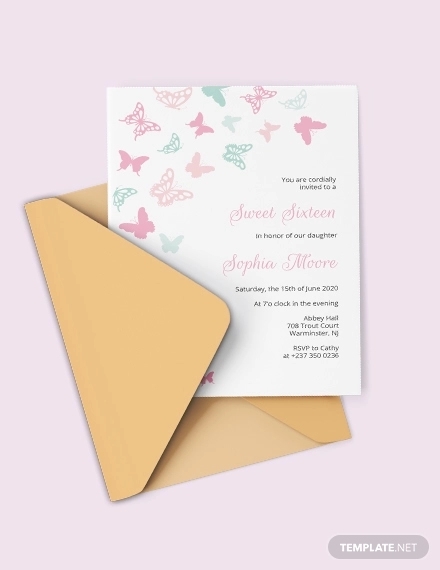 Ordering this invitation card design will allow you to choose between two card backgrounds. Or you can also make use of the two versions for your party. Also remember that the Animals Birthday Invitation Card is a digital card template and you will need to print out the cards (after adding your party details) at your local print store or use your a home printer. You may also browse through the site and find other kid’s food menu design inspirations. 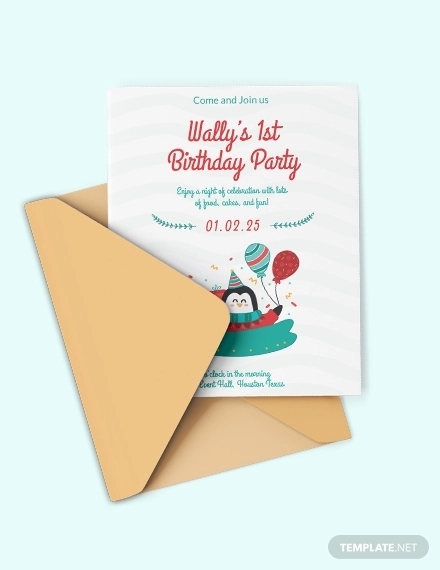 So that you have finally decided on a birthday party theme and have chosen what birthday invitation card design to use, let us remind you some invitation-giving etiquette. This will be helpful in dealing with all sorts of scenario before, during, and after the event. Send out the invites ahead of time as possible. It is best to send out birthday party invitations at least 3 weeks before the event. The farther away from the event date it is sent out, the better. Whether a parent who is planning your child’s birthday party or you are planning your own birthday, notifying other people ahead of time allows them to plan out their lives and respond if they can make it to the event or not. Sending out an invitation ahead also ensures that you know how many people to prepare food, souvenirs, and booze for. Include RSVP cards. This makes both you and the invitation cards easier. Both parties are able to plan out the event more successfully if party attendees fill out their RSVP cards on time. You may also note on the invites that invited guests can contact you through email, social media, or phone to confirm their attendance to the event or not. When planning your child’s birthday party, be considerate of your child’s other classmates. To avoid a whole classroom-full of students to be feel bad about not being invited to a party, you should either give out cards privately or invite the whole class. The latter option is better because it can help the class relate with each other and not make anyone feel left out. Be conscious of others’ financial status. Even if you are able to hold a birthday party for yourself, your other friends cannot all do the same thing. In the same way, it is better to state in your invitations that gifts are not compulsory. Or you may also use your birthday as a form of giving back by encouraging attendees to make donations to your preferred charities instead of giving you gifts. Send thank-you cards. Even though the practice of sending thank-you cards is no longer strongly observed, it is still good party etiquette to send thank-you cards to those who have invited you or vice versa.